Puerto Vallarta is best known for its old world style, internationally recognized restaurants and burgeoning arts scene. Often overlooked are its numerous beaches – each offering a different charm and unique character. 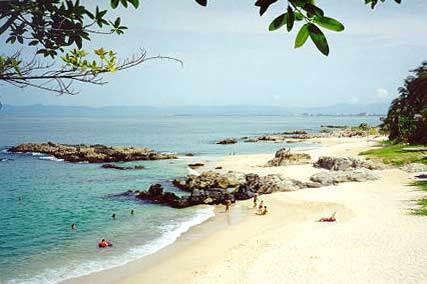 Of course we’re biased but we think the best among them, in fact one of Puerto Vallarta’s best kept secrets, is Conchas Chinas beach. ‘Conchas Chinas’, literally Chinese shells, is a relatively small secluded beach that has some of the calmest waters in the bay. It’s a short walk from Casa Aventura and offers all the upside of a safe welcoming beach without the downsides of heavily trafficked tourist traps. 2. Very few beach vendors. And we mean very few. There just aren’t enough people to make a living selling the various items vendors are selling on virtually every other beach in Puerto Vallarta. While we love the character and color beach vendors add to other beaches in the area, sometimes you just don’t want to be bothered. 3. The calm waters. Conchas Chinas beach is one of those beaches where you can spend an entire afternoon body surfing, wading, or building castles with wet sand because the surf is consistently calm. Fun times for kids, grandparents and everyone in between. One of the reasons the waters here are so calm is also the next reason we’ve fallen in love with this secluded spot. 4. Sea life. Yup, the sea life. Conchas Chinas beaches calm waters are due in some part to a natural rock formation that stretches out a few hundred feet from the steps where you access the beach. This jetty both creates a barrier from stronger waters and a paradise for hundreds of sea creatures in their own little ecosystem of tide pools. Starfish, sandcrabs, small fish – you name it! Get ready to explore. While all beaches in Puerto Vallarta are public, some hotels and time shares have made access so difficult that their own ‘private’ beaches are essentially restricted to clients of the hotel. Good news here is there are no hotels or timeshares in the general vicinity making Conchas Chinas as secluded, safe and untouched as possible in Puerto Vallarta. ©2017 Casa Aventura. All Rights Reserved.